Chicago’s great fire of 1871 was brought vividly to mind yesterday when a $1,500,000 blaze in grain warehouses and freight sheds in the neighborhood of Sixteenth and Canal streets jumped the river. When Mrs. O’Leary’s cow squinted back at the milk pail and then kicked over the lamp the fire that resulted took on the dignity of a conflagration when it leaped the south branch of the river. So yesterday, when tha fire, having destroyed two grain elevators, then kicked up fifty freight cars, burned a freight house and many iimaller buildings, leaped the river and began on the other side, the firemen became apprehensive. But eighty pieces of fire machinery, including great fire tugs throwing streams of water half as big around as a barrel, were on hand to fight this fire and they made short work of the blaze. Firemen making heroic effort, using their helmets to shield themselves from the heat. The fire will be famous for its running jump. It isn’t often that the river is crossed in this way, the last time being In the S. K. Martin fire in 1894, an August fire like this one. The other striking feature about the fire was the miraculous escape of the firemen and spectators. The area burned over was not less than ten acres. 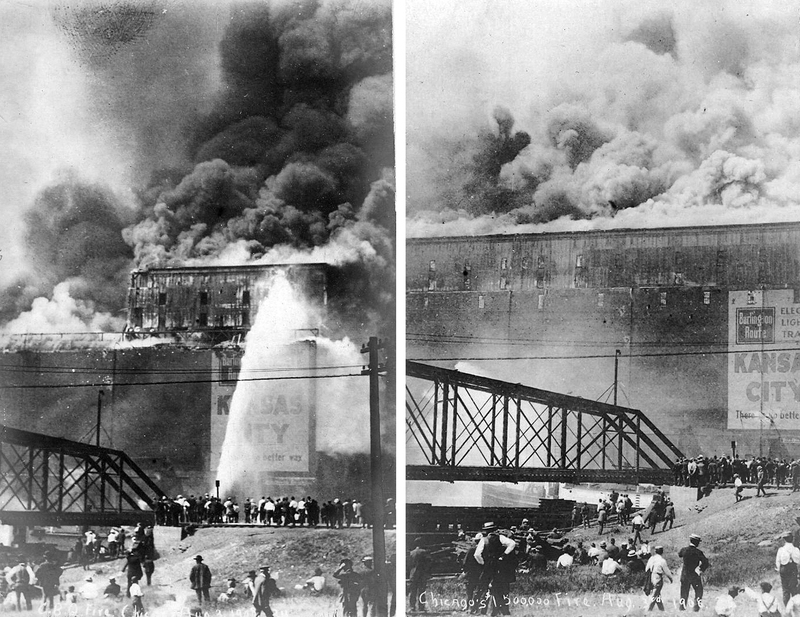 Men were hemmed in seemingly by flames in every direction, warehouse walls 100 feet tall fell and adventures were as common as they were spectacular. And wben it was over Chief Horan counted bis men and each one responded to his name. Armour & Company lost $750,000 in wheat and corn stored in the elevators, and $500,000 on the buildings themselves. The remaining $750,000 in the main falls on the railroads—Burlington, the Fort Wayne, the Pere Marquette and others that owned the elevator buildings, the dock freight houses and the freight cars. Of these railroad companies count the Chicago, Burlington & Quincy as losing $180,000, this sum representing the elevator buildings, the freight shed and other sheds. The Armours had insured all the grain and the railroads carry their own insurance. While the firm was big to the eye and prolific of incidents it inflicted little suffering upon the people. Railroads were blocked,surface lines stopped and traffic on the river halted for hours. Chief Horan says the fire in places may smolder for days. hard to say where it would have ended. It Is sate to say that Chicago was at the mercy of the wind and fire yesterday for almost two hours. After half an hour’s delay the Chicago, Burlington & Quincy Railroad train to Denver was backed into the Union Station and ordered to leave the city over the Milwaukee and St. Paul Railroad tracks. cigarette among a quantity of chemicals stored in the place. A few minutes later the building, a long wooden structure used for outgoing freight was a mass of flames. Soon after the fire had gaJned considerable headway several explosions of chemicals were heard, ond firemen, aided by a number of dock laborers cast hundreds of barrels of potash and and saltpeter into the river. Holes were blown in the roof of the dockhouse by tbe explosion of chemicals. After the first two elevators hod caught fire, the heat from the burning grain became so great that firemen could not approach within half a block of the flames and the paint on the fire boat Chicago, which was the nearest to the scene was scorched in a number of places. Lack of fire plugs for a time hampered the fire fighters, but this difficulty was overcome when they stationed their engines near the river and drew water from the stream. Thousands of pedestrians reached the scene aud watched the firemen through the smoke and flames. The flames twice shot across the the river. Burning boards and brands ere carried over the river many times and small ones floated off as far as the lake. Embers carried by the wind set fire to strings of freight cars in many places. Before the engines could be placed and the firemen reach the new scene fifty cars were burned. Rain of Fire on Spectators. Once hundreds ot bushels of grain in a blazing elevator exploded scattering everywhere and falling like a rain of fire on the heads of spectators, who fled in a panic in all directions. While the firemen were trying to confine the flames to the two “Q” elevators the Union elevator was threatened with destruction, embers setting tthe roof on fire. Chief Horan ordered his men to the roof, and there, high in the air, they fought a triumphant fight. Similarly the courageous firemen stopped the fire in the plant of the Jaques Baking Powder Company. Lives of Thirty Five Men Saved. In elevator F one of the “Q” elevators filled with Armour grain, thirty firemen were working when the place caught fire. Through the exertions of firemen and warehouse foremen, they were all notified and got out of tbe building in time. 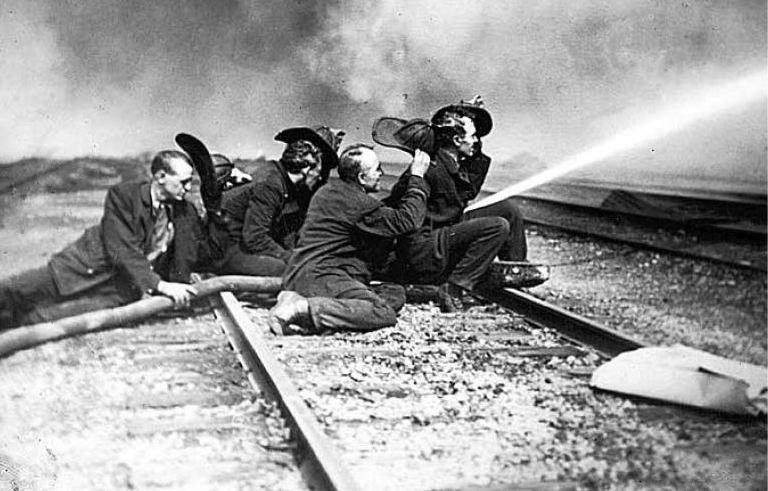 Fifty locomotives in the railroad yards were lined up, blocked by lines of fire hose crossing the tracks. Shifting wind covered them with blazing embers and sparks. The crews ran for life to the river. The wind changed again and the engines were moved to safety. When the Erie Railroad property was threatened fifty men were sent to fight the sparks, extinguishing every one where it fell. While the firemen were fighting the great fire in one of the elevators the toolhouse behind then caught and was past saving when it was discovered ablaze. 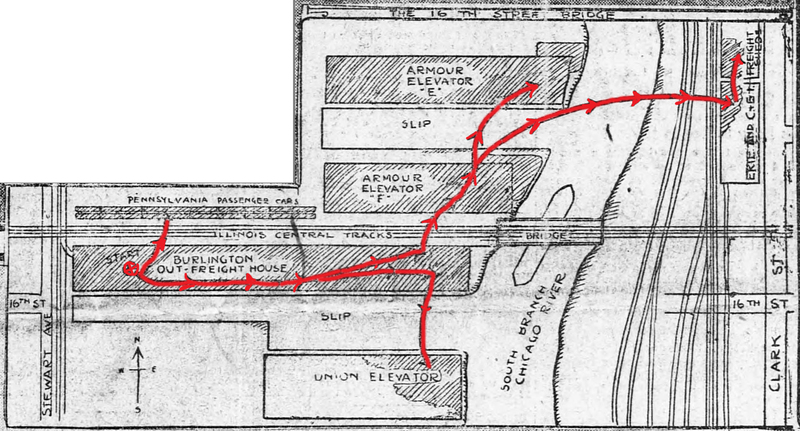 Course of the fire, showing its point of origin and the route it traveled, leaping the river and the slips is given in the diagram sketch above. Embers Travel MIles In Air. The south wall of elevator F fell into the rIver at 3 o’clock, tbe storm of sparks was twisted by the wind, startIng numbers of small fires on roofs of buildings. On yachts in the lake after this whirlwind of flame, embers stlll blazing were seen to fall miles from the caldron of fire of fire on the river. The crash of tbe scorched ruin into the river mingled file with spray something firemen In Chicago never witnessed. Fire-boats were rocked and tossed about, the streams from their giant nozzles being deflected from the spot they were intended to reach and sending quantities of water down upon crowds of spectators. Fortunately it was seen in time that the elevator wall was sure to fall, otherwise the crews of the fireboats Sweenie and Illinois would have been caught in a deathtrap. Chief Horan fought the fire from the most dangerous spot along the river. When the blaze was at its height, Chief Chief Campion, who has been attracted by the danger, touched Horan on the arm. “Let me fight that fire as a volunteer,” urged Campion. On the elevators alone at one time three fireboats were pouring tons of water and twenty-five engines were throwing streams. So intense was the heat in the burning grain that the fall of this weight of water served only to increase the height because of the cloud of stream, which could be seen ten miles away. At one place, Sixteenth and Canal streets, a crowd of 2,000 persons gathered. In the excitement the people pushed and shouldered one another. Women fainted or screamed with fright in the crush. The police were powerless to control the crowd at times. In every open space for blocks around the fire great crowds gathered. It is estimated that fully 100,000 persons watched the flames. Among the buildings that caught fire were two small grain grain elevators at the south end of the Union Depot. Fortunately this was noticed from a fire boat and the flames extinguished in time. While the Union elevator was threatened, firemen g=fighting the fire on the roof, Henry Lesch, representing the owners, was before the Board of Review trying to get the assessment reduced. Lesch said the land was worth enough to warrant the assessment upon it, but that the improvements were certainly not valuable enough to warrant over $100,000 assessment. Armour lost in one elevator 500,000 bushels of wheat, in another 200,000 bushels of wheat and 100,000 bushels of corn, grain worth altogether $750,000. Freight cars destroyed in the fire were worth fully $75,000, some of the fifty cars burned being new. It was at 2:10 p. m., more that an hour after the fire started, that it first performed the river jumping feat. Twenty engine companies were hurried across the river, arriving even before the flames fairly gained a foothold. Thousands of spectators cheered the firemen on this occasion. During the fire the wind veered twice. The first time it carried the main body of the blaze near a big vessel docked near the elevators. Three tugs made fast to the schooner and towed her out through the flames. All hands were on deck and many seamen in the rigging, braving the danger to be ready to extinguish the sparks as fast as they fell. Prinicipal Losers—Armour & Co., and the C. B. & Q. R. R.